A variety of literature on minor surgical procedures happens to exist claiming high efficacy for those suffering with nasal valve collapse. But chances are you never heard about most of them. Some of the specific procedures are used in conjunction with other surgical grafting procedures, but a number of studies have shown that these procedures exclusive to other procedures can stand on their own for remedying NVC for certain individuals that are diagnosed correctly. They don't involve major grafting of the nose, or any in most cases, relatively not intricate and can take anywhere from 1-2 hours to complete, could be covered by insurance or Government health care system, can improve nose aesthetically or remain about the same, and very minimal down time. Caution: Nasal valve collapse is a multidimensional problem. In some patients, the reduced cross-sectional area or an acute valve angle of less than 10° is the main problem. 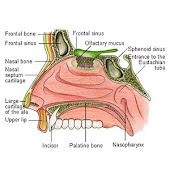 In others, the weak nasal sidewall plays a major role. In some patients, a combination of factors exists.Consequently, because most of these procedures focuses on only 1 factor, none is universal for every situation. I will divide some of these procedures as follows: Plasty techniques, Suture techniques, Lateral crura options, butterfly grafts and synthetic injectable grafts. I plan to discuss most if not all in more detail in upcoming posts. Here's a list of minor procedures for improving NVC. Dr. Dean Toriumi has reported serious issues with injectable fillers in the nose. Here is some information from his website on this issue. The most concerning phenomenon is that many dermatologists, generalists and surgeons are performing non-surgical rhinoplasties. In these cases, semi-permanent or permanent injectable filler materials are being injected into the nose to make long lasting contour changes. Some of those who are performing the injections are not rhinoplasty surgeons and may have little if any understanding of the nasal anatomy and nasal aesthetics. I have seen many patients treated by such physicians with severe nasal skin envelope problems such as infection, swelling, pain, permanent redness and deformity. Unfortunately, many of these patients cannot be helped because correction of the problem requires resection of the filler material. Resection puts these patients at severe risk of permanent skin damage in the form of intense redness or skin necrosis, leaving a hole in their nose. Additionally, we do not know the long term effects of such materials on the nasal skin envelope. There is an intense need for scientifically sound research that demonstrates the safety and efficacy of these materials in the nose. Scientific research may show that these filler materials when placed deeply against the bone and cartilage are safe when used in the nose. The nose is a very important structure of the face that greatly influences the overall facial appearance. Caution should be taken when doing anything that could potentially damage the nose and leave the patient with a permanent deformity. Confused about what's the difference between Lateral crural strut grafts and alar strut grafts? Or rim grafts and Alar batten grafts? Alar strut grafts and Lateral crural strut grafts are same. But Alar batten grafts are not the same. For more detailed info click on links provided within the following link. There has been a recent innovation for resolving valve collapse that involves re-positioning the lower lateral cartilage up onto the upper and bringing stability to the scroll region, it typically involves a temporary stent during the healing phase. It's minimally invasive and doesn't require donor sites or grafting.